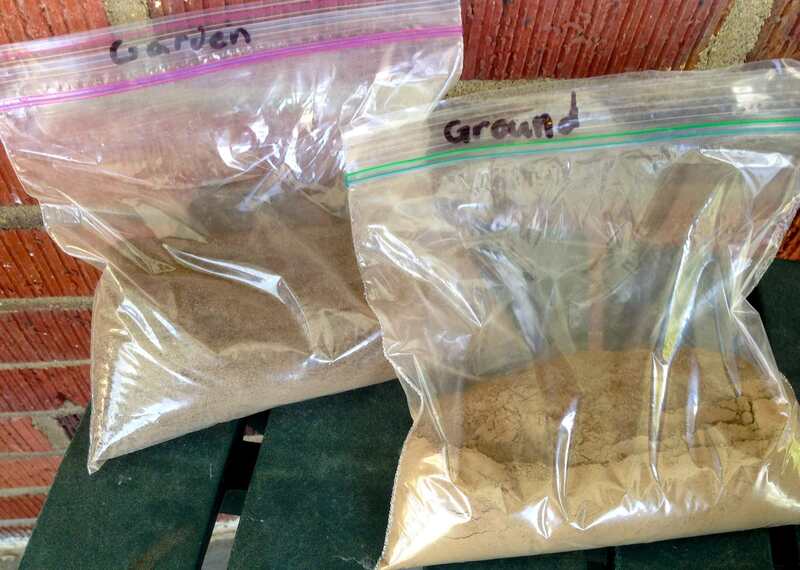 Compost (left) and vermiculite/peat moss (right) are what we used for our new soil mix. It’s hard to believe we have been in our house for more than five years. We started our garden the spring after we moved in and our raised bed frames have become a little worse for wear. The wood was splitting and cracking, and they generally looked dilapidated. Our plan this year was to make the beds themselves a little taller, adding another layer on top. Matt suggested replacing the entire frame with new wood, and I’m glad we did. The wood we bought was 6 inches tall and then 4 feet long, and we overlapped each end to make an even square. Just the wood makes our garden beds look so much better! Because these were so much taller than our other beds, we needed to fill them with soil. This year we decided to follow Mel’s Mix from the square foot gardening method. It was fairly expensive to get all the ingredients, but they say the mix will last for years, with a little top off of compost each year. Also, our garden is pretty big if we consider it all together — 112 square feet — and you’re supposed to fill the beds 6 inches deep. It’d probably be less expensive if the garden is smaller. Mel’s Mix is one-third each of compost, peat moss and vermiculite. The compost (you’re supposed to have at least five different kinds to not overload on one nutrient) provides the plant nutrition and the vermiculite and peat moss help keep the soil workable and hold water. It was quite a task to make this mix by myself — Matt was on a work trip and I needed to get plants in the ground — but I made it work! We did end up saving the old garden boxes and are planning to use them as mini greenhouses to start the seeds I saved from last year’s plants. It’s been about a month since everything was planted and so far, so good. Except for a few plants providing dinner for the deer, our vegetables are looking healthy and (fingers crossed) pest/disease free. I’m not quite sure I stuck with our planting plan for each bed. For the most part, it’s right, but I made some adjustments. Here’s what we have, starting from back bed at the left of the garage. Earlier this spring I wrote about a random plant making an appearance. After weeding the rest of the bed, I dug out these two seedlings and put them in small containers left over from vegetable transplants we usually buy at the garden center. I suspect one is squash because it sprouted where we had a zucchini or yellow squash plant last year. The other was closer to the trellis, so my best guess is that it’s a cucumber. We’re going to let them grow a little more and get sturdier before putting them in a larger pot. It’d be great if these volunteers actually turn into viable plants. If nothing else, it will save us a few bucks this season. What’s needed for soil testing. As I mentioned in a previous post getting our soil nutrients right is one of the major goals of our garden this year. We bought a test kit from the county, and a few weeks ago we dug up samples from each bed and the ground to send to the lab. There are two reasons we are testing our soil this year. The first is to get a good analysis of what nutrients are present. The tests will let us know how much magnesium, calcium, potassium and other important elements are in the ground. Once we know that, we’ll have a better idea of how to amend the soil to give each vegetable its optimum level of each nutrient. There was a big color difference between our ground and garden soils. The second reason is to test for potentially toxic elements like lead or arsenic because our garden is around our garage. It’s been there for almost 60 years so who knows what might have spilled and/or leached into the ground around it. It was kind of interesting to see the difference in the colors between the garden soil and the ground soil. It’s not a difficult process, and I’d recommended it to other gardeners. Step 1: Order the test kits. Our county doesn’t do it’s own testing, but they still sent us kits. They were $12 each and will be sent to the Michigan State soil lab. Crush the dirt to a powder. 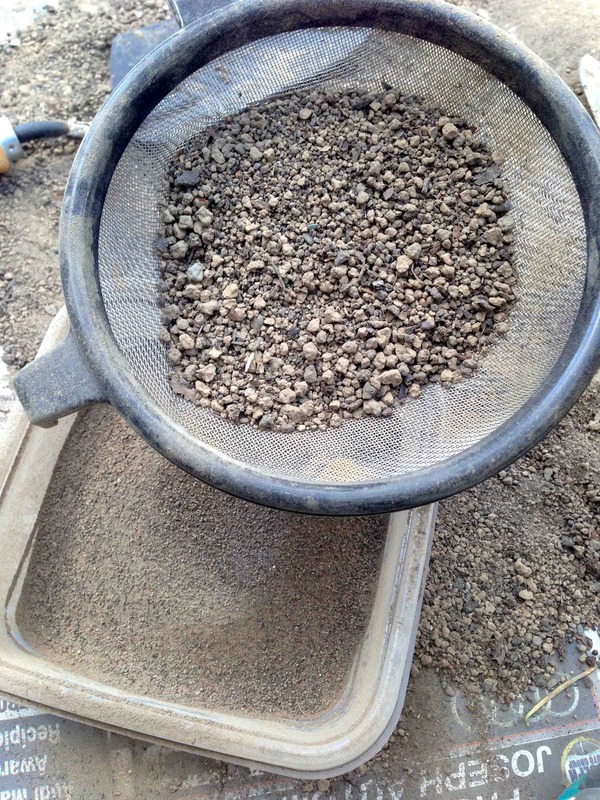 Step 2: Dig a 6-8 inch hole from several different areas in the test area then mix everything together in a bucket. I used an old hanging basket pot. 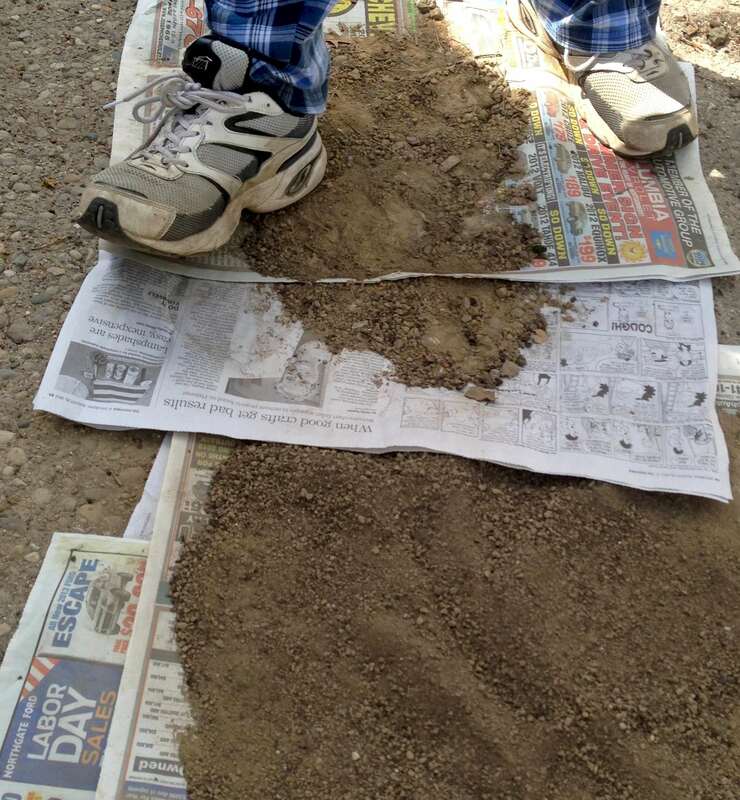 Step 3: Spread the soil in an even later so it can dry out. We just put it on some old newspaper in our garage for a couple weeks. Step 4: Once it’s dry, break it up as fine as possible. We just stepped on it and crushed the clumps with our shoes. A fine mesh strainer separates particles from powder. 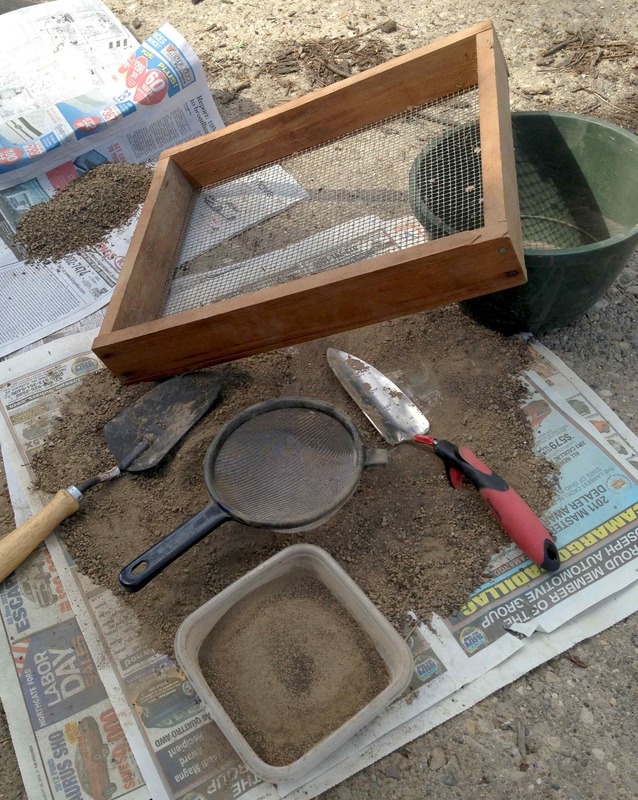 Step 5: Sift the dirt with a screen. We have one my grandpa used to use. This gets out leaves, twigs and any other objects. We found a rusty nail and a small piece of broken glass in ours. Step 6: Use a fine mesh sifter to get even more particles out. It’s important that the dirt be almost a powder. We used a small strainer from our kitchen for this part. Step 7: Once it’s sifted, measure out the correct amount the lab needs and send it in! I’m excited to see the results and hope that they don’t find anything bad. This is pretty much what my last Saturday looked like. I spent hours reading about the needs of each plant, looking up companion plants and plotting our garden. 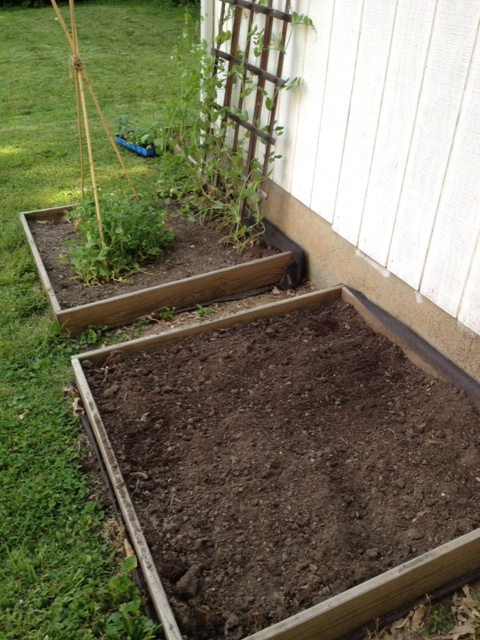 In addition to more planning, we’re also following the square-foot garden method. Not exactly, but we plan on spacing the vegetable plants a little closer than we have in the past. Part of the problem is we have limited areas that get enough “full sun” for some of the vegetables to thrive, which makes full crop rotations more difficult. You can find a copy of our planting plan here, but I’ll explain some of the methodology below. 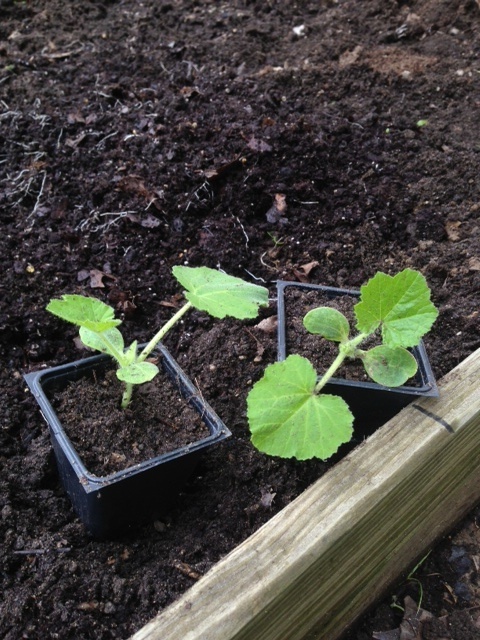 Bed 1 – Cucumbers will go up a trellis at the back with radishes planted in front to help deter the cucumber beetle. We’ll also plant 6-7 pepper plants here with space for spinach at the front. Bed 3 – Tomatoes with basil interspersed throughout. This is a smaller bed, so we’ll also plant some grape tomatoes in containers. Bed 4 – Our other “nightshade” family bed. A couple more pepper plants with at least three eggplants. Also mixing in herbs like parsley, chives and thyme, which are supposed to be good companion plants. Bed 5 – “Cole” crops, which don’t require as much sun like Brussels sprouts and broccoli. Also adding a row of sage and oregano to help deter cabbage butterflies, which devastated our plants last year. Bed 6 – Spinach & lettuces. This bed gets morning sun but is otherwise shaded by the maple tree in our backyard. Also planting some herbs here that supposedly deter slugs (chives) and cabbage moths (dill). We’re still relatively new at this, so any advice on our plan would be welcome! There is exactly one month until spring. To me, spring means getting the garden ready and planting some of our favorite cool weather crops like peas, lettuces, spinach and broccoli. I’ve still been reading a lot about gardening methods and strategies, but, I must admit, it hasn’t been as often as I should. And with one month to go, we’re in get-it-done mode. Last night I busted out the gardening books and spent tons of time going through notes from last year. We have to keep a more detailed notebook for this planting season. It’s an absolute must-do goal for us. There is also A LOT of prep work to be finished before it warms up. Primarily, it’s soil tests (which were ordered from our county) and removing the black landscape fabric from under our six raised beds. We still have to add another layer to our wood frames, mix in new dirt, and turn under the decomposing leaves we left on each bed this fall. I forgot how useful each of the gardening books we own is, and I don’t know why I didn’t refer to them more during the summer. They’re a great resource and I’d recommend them to anyone. 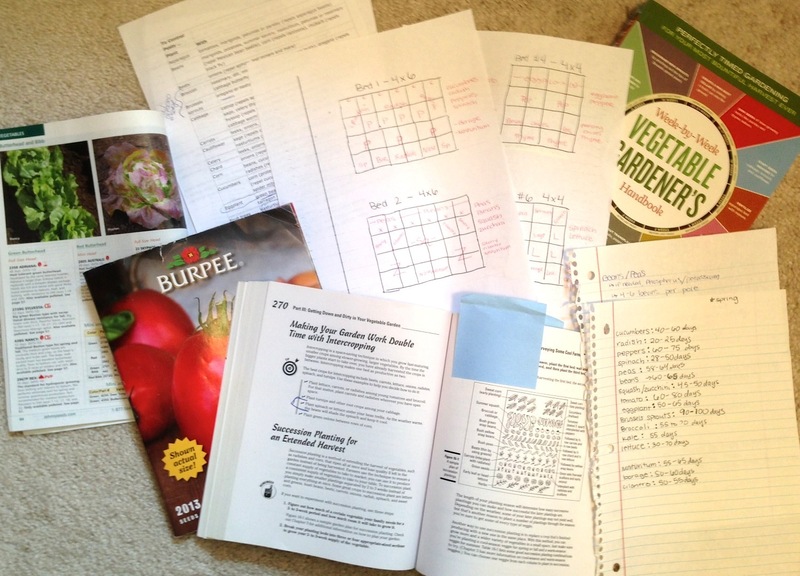 Here’s the list: The Week-by-Week Vegetable Gardener’s Handbook and Vegetable Gardening for Dummies. I felt silly buying the latter at first, but it’s really helpful. Finally, The Reader’s Digest Illustrated Guide to Gardening. That’s a hand-me-down from my mom, but the updated version is probably just as useful. Now it’s back to hitting the books and getting ready to plant some vegetables as soon as the soil warms. 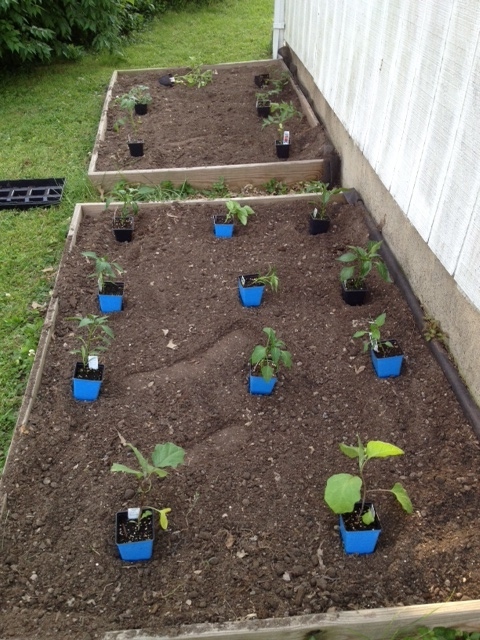 A couple weeks ago we planted most of our vegetables in the garden. Several hours and a few garden centers later we had our plants and herbs. Everything is in it’s place, now it need to be planted. Peppers and eggplant in the front, tomatoes in the back. It took a while to weed and prep all the beds but we managed and everything looks great! Our garden is around the detached garage — we have two 4 by 6 raised beds in the back and four 4 by 4 beds along the side. It’s a perfect location because the back faces south and we get a great amount of sun throughout the day. Last year, we didn’t rotate any of our plants, which might explain why our vegetables didn’t do so great. We switched it up this year and have everything plotted out a little differently. • Tomatoes – Romas, regular slicing ones (early girl and better boy) and grape, two plant of each. • Peppers – five bell pepper plants, two jalapeño, one Anaheim and one mild banana pepper. We also planted two eggplants in that bed. • Peas – these are winding down and we will plant cucumber and squash in that bed soon. • Green beans — the Kentucky Wonder pole beans did great last year so we are trying those again. Still undecided on using a trellis or poles. • Herbs – two parsley plants, cilantro, thyme, oregano, chives and two sweet basil plants. We also want a Thai basil but haven’t been able to find it this year. • Lettuce and brussels sprouts – we planted a few different varieties, red and green looseleaf, butter crunch and another variety I don’t remember. Our broccoli was eaten by squirrels so we planted some brussel sprouts at the back of the bed. Let’s hope everything does well this year! Bed for the beans is prepped and ready. We’ll plant squash and cucumbers where the peas are now (back). 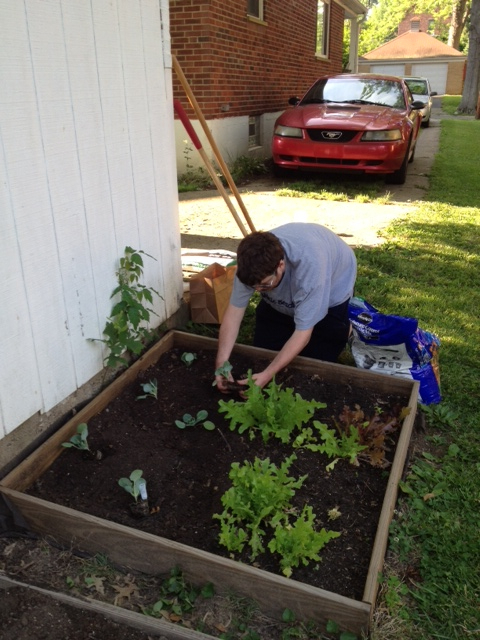 Matt is planting the brussel sprouts at the back of the lettuce bed. Dang, those peas got tall!